The U14 Manhattan-Hermosa Little League all-star team consists of Garrett Baliton, Ian Draves, Matthew Field, Ben Gneiser, Namath Hogan, Max Jonas, Addison Lee, Ryan Lee, Robert Love, Connor Meidroth, Alex Rohm, Dondillon Rohrer, Jackson Shea and Charlie Webb. Managing the team is Tony Caswick aided by assistants Dave Williams (1984 CSUN World Series Champion alum) and Ty Conrad (2016 Mira Costa slum and current El Camino College player). 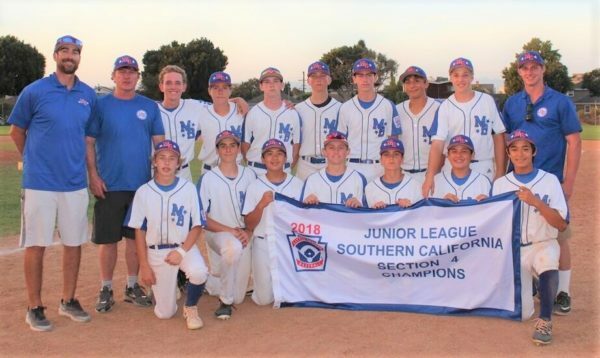 The Manhattan-Hermosa Junior All-Star baseball team captured the Section 4 Championship capping of a three game sweep in the championship round while going undefeated. After an opening- round loss, the team won six in a row scoring over 70 runs while giving up 15. The team, which excels offensively, defensively and is strong on the mound, advanced o the Southern California Division III playoffs in Thousand Oaks where it won its first game with a 10-1 victory over La Puente. The local boys will face the Ken Hubbs-Dos Pueblos winner on Saturday in a 1:30 p.m. contest. The victor advances to the semifinals on Sunday with the championship taking place Wednesday. The champion will play in the Western Regional Tournament in San Jose beginning Saturday, July 28.